The Society of St. Vincent de Paul, a lay catholic organization with branches found around the world, has been active in our community for decades, with the goal of serving those in poverty among us with love, respect, justice and joy, regardless of religious affiliation, and with a heavy emphasis on the personal touch. By visiting and making person-to-person contact with those in need, the Society gets an in depth look at what is truly required by a family or individual. Many of us are familiar with the Society of St. Vincent de Paul through their resale store on Elizabeth St., but their presence and impact in our city goes far beyond that essential service. They provide home visits, food, clothing, bedding, kitchen supplies, and furniture to those in need. St. Joseph Conference encompasses every household west of Edinburgh Road – from north to south – a large segment of our city. One of the most obvious needs, and one of the most expensive, is the purchase of new beds. Because of sanitation and health concerns, used beds are not accepted for donation. St. Joseph Conference alone buys on average five single and three double beds every month, which takes up a considerable portion of their available donated funds, even with discounts from the local bedding stores. By selecting the Society of St. Vincent de Paul St. Joseph Conference to be the recipient of their latest quarterly donation, 100 Women Who Care Guelph ensured that beds could be provided for the next 20 months. Visit www.100womenwhocareguelph.com for more information or to join 100 WWCG and help support those in need in our community. This entry was posted in Press Releases on April 18, 2019 by Tannis Sprott. The women of 100 Women Who Care Guelph responded to the pressing need to provide a wide range of medical services to those most marginalized in our community. For those on the fringes of society because of poverty, mental illness or addiction issues, the difficulty of purchasing ancillary medically items that fall outside a medical or drug plan can be daunting. Thanks to this $12,000+ donation, the Drop In Centre can now provide assistance with extraneous medical expenses, such as the purchase of eye glasses, hearing aids, and walkers, with accessing much needed dental care, with providing cab fare to the hospital, as well as assisting with prescription medications not covered by any other plan – all things considered essential for good health care, and which most of us take for granted. 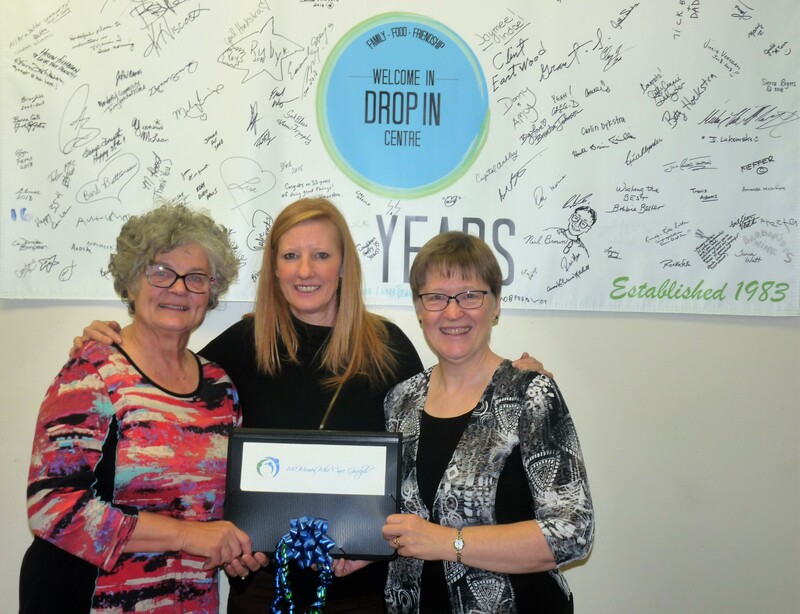 Since its founding in 1983, the downtown Drop In Centre has been a central hub offering critical support services to those in need. Thanks to the vision of its founder Sister Christine Leyser, and an army of volunteers, hundreds of at risk individuals in our community can find the assistance they need. The Centre serves over 100 meals every day, provides emergency shelter, and can connect individuals with resources for mental and physical health, substance abuse, trauma counselling, and legal aid. They even provide veterinary care to pets (and their owners) that are homeless or precariously housed. Truly, all are “Welcome In” to the Drop In Centre. This entry was posted in Press Releases on October 16, 2018 by Tannis Sprott. Sunrise Therapeutic Riding and Learning Centre can now go shopping for another horse, thanks to 100 Women Who Care Guelph. With the benefit of a member presentation on behalf of Sunrise, each 100 WWCG member was given a window into the challenges a special needs person faces. Isolation. Loneliness. No control. The “other” among us. These phrases are so often found linked in describing the lives of children and adults coping with either physical or cognitive special needs. The world becomes a very small place, with little opportunity for socialization, the making of friends, or the opportunity to take control of some aspect of your life, and denies them all the benefits those things accrue. Fortunately there are helping hands out there in our community, a valuable one being Sunrise Therapeutic Riding and Learning Centre. There, Therapeutic Riding Association certified instructors, along with an army of volunteers, have helped create a community where through weekly riding lessons those with special needs aged 3 and up can develop muscle strength, improve balance and concentration, make friends, and develop a sense of achievement and independence resulting in increased self-esteem and self-confidence. It has always been a simple formula: Kids + Horses = Magic. With a donation of over $13,000 from 100 WWCG, Sunrise can now purchase one more therapy horse, thereby shortening their waiting list, sponsor more individuals to the program, and expand their barn areas which allow the kids to work with their own horse. This donation marks the beginning of the fourth year of supporting Guelph charities for 100 WWCG, reaffirming their compassion for others and their connection to community. For more information or to join, visit www.100womenwhocareguelph.com. This entry was posted in Press Releases on October 17, 2017 by Tannis Sprott.